In honor of National Theory Appreciation Day, the Fermilab Theory Department will be serving free coffee and chocolates on the 3rd floor of Wilson Hall. The final game of the Men's NCAA Basketball tournament will be shown on the big screen in Ramsey Auditorium. Whistles, big foam hands and pompoms provided. Friday, March 31 Guest Chef Rachel Ray presents an array of 3-minute meals for $5.00 each. The Wilson Hall Cafe now accepts Euros at Cash Register #1 and Yen at Cash Register #2. Spokespersons say CDF will freshen up DZero's image. In an effort to spruce up their respective experiments and to maintain the highest standards of scientific objectivity, the CDF and DZero collaborations will emulate the popular TV series and "trade spaces" following the restart of Tevatron operations this spring, their respective spokespersons announced this week. The prospective move is projected to have benefits for both experiments. "After a few years of running, even the best of control rooms can begin to look a bit tacky," said DZero spokesperson Gerald Blazey. "A fresh set of eyes and some new ideas can only help. And we have some thoughts of our own about how to brighten up the CDF trailers." CDF spokesperson Rob Roser agreed. "This is a no-brainer," Roser said. "It makes perfect sense, not only from a decorating standpoint but for data analysis. We've been poring over the CDF Run II data for months now. Let's let someone else take a crack at it! And for our part, maybe we can see some things that DZero may have missed in their own analysis. Also, that dog logo they have on the DZero trailers? Soooo last century! Let's just say that I think we can come up with something with quite a bit more pizzazz." Asked who would present which experimental results at the upcoming spring and summer conferences, both sets of spokespersons said that remained to be worked out. "There will certainly be some transition issues that we'll need to deal with," said CDF's Young-Kee Kim. "But the point is that we are going into this with a positive spirit. It's the right thing for the experiments, the right thing for Fermilab, and the right thing for particle physics." DZero may find things overlooked in CDF data. Oak Ridge, TN- After six grueling years of Herculean research, scientists at the Oak Ridge National Laboratory pronounced EHC-1 Alpha, the new hyperbolic chamber, "an unquestionably, undeniably, fantastically revolutionary milestone in the history of science, mankind and the universe, all of which it will undoubtedly change forever." "Hyperbole researchers have arrived at, without possibility of argument or refutation, the single greatest moment in all of creation, now and forevermore," said the project's lead scientist, Dr. Lloyd Gustaveson, activating the hyperbolic chamber's gazillion-ultra-watt semantic resonator at a gala launch party Monday. the ILC GDE's EC has formed an Acronym Recommendation Group (ARG). Chaired by FNAL's Shekhar Mishra, the ARG will ensure that ILC design progress proceeds unimpeded by complications of combinations and permutations. "I am excited at the prospecting of working with my international colleagues on this task," Mishra said. "Clearly, collaborators from KEK, SLAC, DESY, CERN and a host of other labs and institutions will add much to these conversations." FNAL's Peter Garbincius, chair of the ILC GDE's DCB welcomes the addition. "I think I can speak for the DCB, as well as the RDB and the CCB when I say that ARG is a welcome addition to the GDE," Garbincius said. "The ILC is a groundbreaking project and we have been burning through three-letter acronyms at an unprecedented rate." ILC GDE Director Barry Barish believes that the ARG will play a increasingly important roll in ILC design. "Upgrade path is a major consideration in all aspects of ILC design," Barish said. "We have to be prepared for all possibilities. Shekhar is the right person to lead this group," Barish added. "Have you seen this guy Sodoku?" FNAL theorist Joe Lykken agrees. "While we theorists have every reason to think that there are great acronyms to be discovered and analyzed in the three-letter range, I'm very pleased that the ILC GDE is forward-looking in this regard," Lykken said. 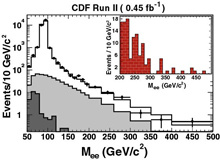 "When data begins coming in from LHC committee, group, task force and board formations, we may find that ILC acronyms may need to run consistently in the four- to five- letter range." While Mishra is confident in the ARG's ability to move forward quickly, he is coming to realize the enormity of the group's tasks. "Honestly," Mishra said, "I am a bit challenged by the fact that our first charge is to establish the acronym for the 'Group Offering Direction on Siting,' but we'll figure something out." An overwhelming number of respondents to the online Fermilab Today survey asked to receive more news and information about life at the lab. To keep up with demand, the newly-expanded Office of Public Affairs will now publish a newsletter thrice daily. Fermilab This Morning, Fermilab This Afternoon and Fermilab Tonight will debut Monday, April 4. Join the Fermilab Skydivers and Base Jumpers on the 16th floor of Wilson Hall at 2:00 p.m. today for their monthly meeting. No experience necessary. To ensure compliance with the DOE 72-hour Prior Notification Policy, Fermilab is instituting a 36-hour Prior Notification of 72-hour Prior Notification Items Policy. Fermilab Director Pier Oddone will notify lab employees about the new notification of notification policy at this seminar, to be held Tuesday at noon in One West.